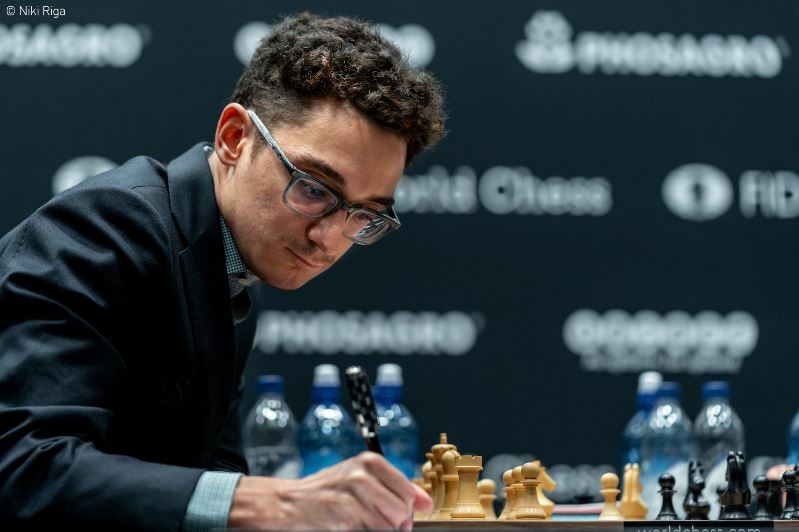 Fabiano Caruana missed his best chance yet to take the lead in the match as he got the better of Magnus Carlsen in the opening to Game 8 but then hesitated and played too modestly at the critical moment. The World Champion’s position was on the verge of collapse, but he pounced instantly when given a chance to steer the game to an 8th consecutive draw, admitting afterwards that he was “happy to have survived”. That leaves only four games remaining in London before potential tiebreaks. Only a handful of games had been played in this sideline, including two by Grigoriy Oparin against Boris Gelfand in the 2017 Nutcracker Battle of the Generations Tournament in Moscow. 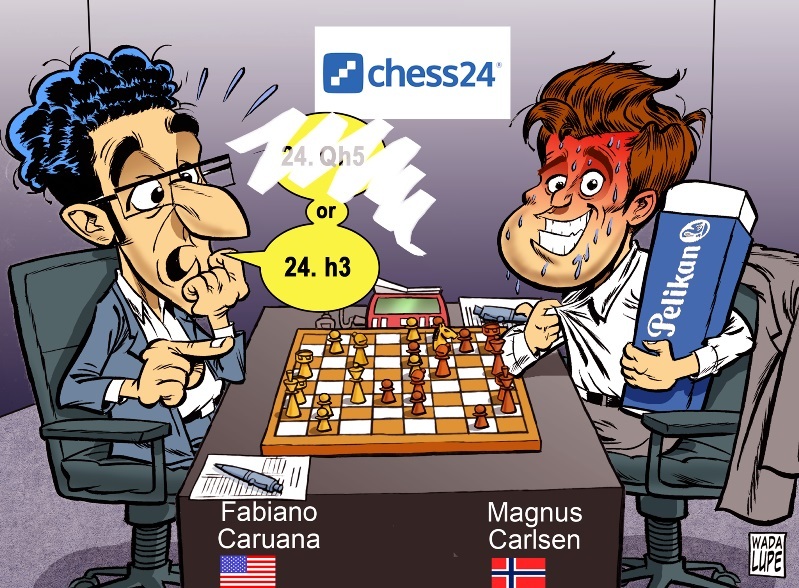 Magnus thought for 9 minutes before replying 12…f5, while 13.a5 had only ever been played this year by chess24 author Niclas Huschenbeth. My team are there working their asses off and I’m very happy with them. It’s just up to me to do better. Magnus definitely doesn't like such positions with the king weakened and it purely tactical. 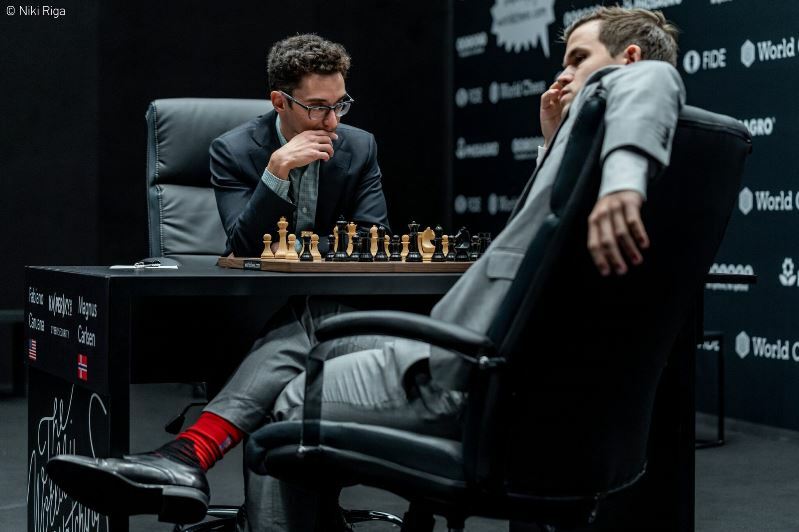 Such a position can even stop him from playing the Sveshnikov… I think he hates his position. I thought my position was dangerous, obviously, and the time situation wasn’t great either, but I couldn’t see a good way to deviate. That was the main issue, so I just had to go for the sharp line and hope for the best, basically. Here I think it’s less than 5 minutes - c5, 5-20 minutes - c5, more than 20 minutes - c5. A little bit of a different position! I actually didn’t consider another move besides c5, but I still thought I should think about it before playing it. That was obviously questionable time management, but Fabiano had taken occasional 30-minute thinks in a few games in the match without adverse effects, and he got some backup from Peter Svidler. The 8-time Russian Champion noted that it was potentially more challenging for Magnus if Fabi thought here rather than stopping to think a couple of moves later, when the position (and calculation) would be simplified for the World Champion. Fabi quickly played 23.Rad1, and since it was also the move Magnus said he considered the main line it was hard to criticise. Objectively, however, it turns out that 23.Rae1 was “sort of mathematically winning”, as Svidler pointed out in his recap, based on the brilliant point that after 23…Bf6 White should play 24.h4! !, and 24…h6 can be met by 25.g4!. Svidler couldn’t justify all the decisions Fabi took, though, adding, “I think the next move you can and should criticize”. The critical moment of the whole game, and for all we know a turning point in chess history, came after Magnus responded 23…Bd6. Fabiano’s 23.h3? !, stopping 23…g4, is a completely understandable move (after 23.Nc4! Magnus felt 23…g4 “should be working”, although computers suggest it isn’t really), but it looks like a timid choice in a dynamic position – not the stuff World Champions are made of. That’s perhaps unfair, since the move could have been strong if not for a concrete refutation – 24…Qe8!. That should have been possible to find, however, and Magnus played it in under two minutes. 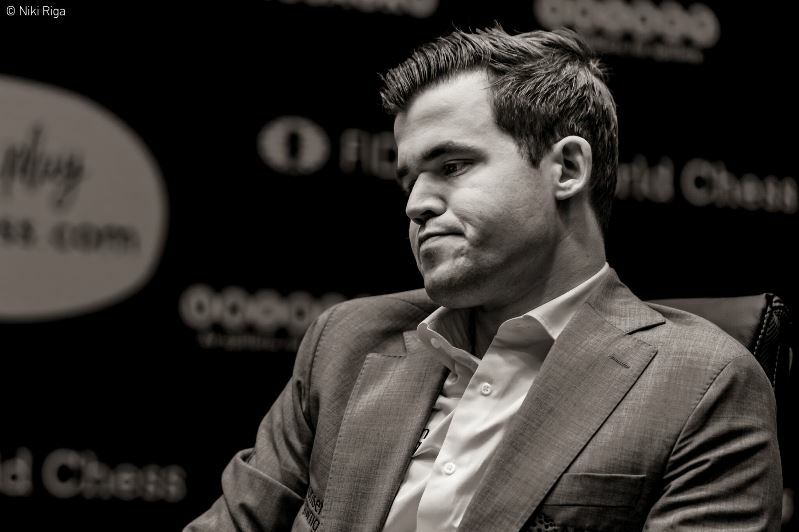 Carlsen: I was quite concerned about 24.Qh5. I would probably have to go 24…Bg6 25.Qh6 Rf7 26.Nc4 Bf8 and 27.Qh3 and I dunno. It was very hard for me to evaluate, but it felt like White is having all the fun. Caruana: Maybe I should go for 24.Qh5 Bg6 25.Qh6, and probably that was a better option. I couldn’t quite make it work, and I underestimated 24…Qe8. Carlsen: Clearly 24.h3 was a relief for me, since then I knew 24…Qe8 was going to be good and very, very likely save me the game quite comfortably. Instead we’re left with four games to go, with two Whites and two Blacks apiece. It’s hard to know who has the edge at this point. Fabiano has fashioned two big chances in the last three games, but Magnus has had the pleasure of escaping. A bit of relief, obviously, since this was a tough game and he was the one who had all the chances. I’m happy to have survived it, for sure. I don’t think the position was ever quite like that. Of course I had some chances, but it’s not like it’s always going to work out, and just because you put some pressure on Magnus it doesn’t mean he’s going to collapse. When he gets the chance to look at the game more deeply afterwards, however, the suspicion is he’ll rue the fact that he didn’t at least make Magnus fight for a half point. I think Magnus takes so much pride in being better than everybody else that he is not even subconsciously aiming for 6:6. He knows it's ok for him, but I don't think that was the plan going into the match, nor is it the plan now. For Game 9 on Wednesday we’ll have world no. 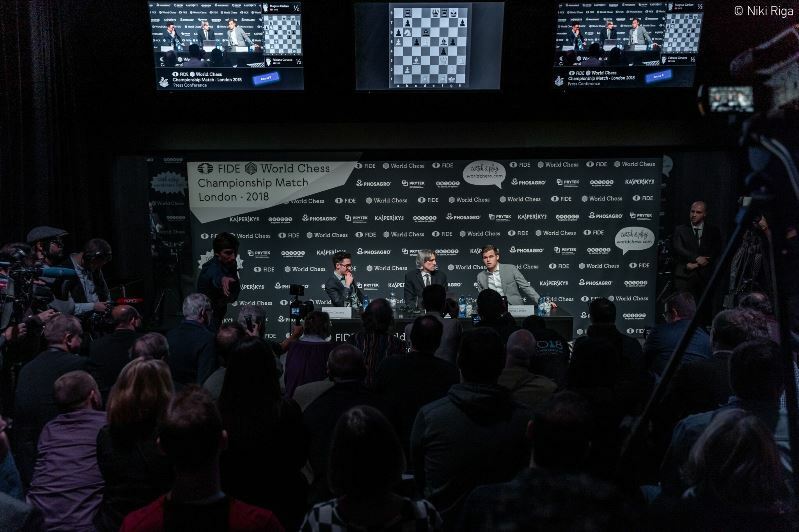 5 Anish Giri alongside Peter Svidler in our Hamburg studio, with world no. 9 Alexander Grischuk calling in again from Moscow! 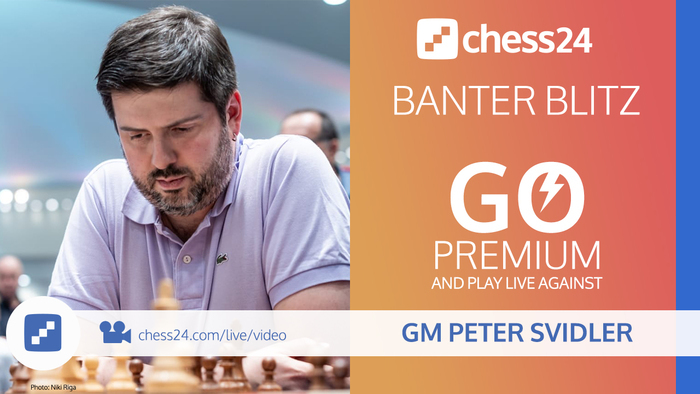 Before that though, the “weak link” Peter Svidler will be playing Banter Blitz on the rest day, starting at 16:00 CET, the same time the games in London start. Don’t miss the chance to play him in what will likely be another 2+ hour show!